WWE 2K14 will deliver more than 45 all-time great bouts and a roster loaded with Wrestlemania's greatest superstars in a showcase mode that pays tribute to three decades of wrestling's premier spectacle. "30 Years of Wrestlemania," is the title of the mode, and the big takeaway for gamers is what it mean to the game's overall roster of fighters. "Re-creating these amazing moments throughout history required 2K to construct the greatest WWE roster lineup to date," Cory Ledesma, the game's creative director, said in a conference call last week. (News of the mode was held under embargo until today.) "The mode itself ends up defining a large portion of the game's roster." 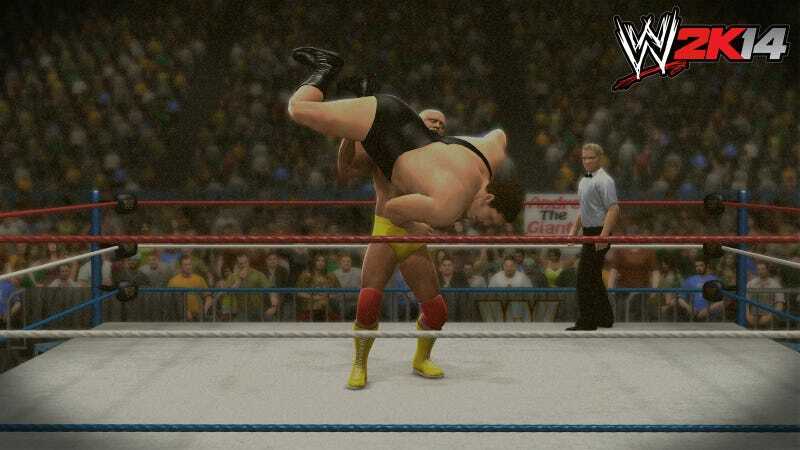 2K Sports isn't confirming any bouts yet except for three: The Rock and John Cena in Wrestlemania 28; The Rock and Hollywood Hulk Hogan in Wrestlemania X8's "Icon vs. Icon" showdown, and Hulk Hogan versus Andre the Giant in Wrestlemania III, a defining event of the 1980s wrestling craze and one which set a North American attendance record that stood for 23 years. "The fact you can in some way relive that and be a part of it as a WWE fan is an amazing opportunity," said Paul Levesque, a WWE executive better known as Triple H from his performing days. While some wrestlers will likely repeat through the card of classic fights, at least 45 bouts means 2K and developer Yuke's will have to put a lot of superstars into this year's game, possibly the largest ever in series history. "It's no doubt that Rock will be in here a lot, and you are gonna see some of the greatest iconic moments from Rock's career," he added. Dwayne "The Rock" Johnson is the cover star of the game, after all. Levesque said the WWE was "excited about some of the characters that this 30 Years of Wrestlemania will allow us to bring back into the franchise. "I think you can see a lot of characters and create a lot of matches in the past that you would have never had the opportunity to do." Levesque mentioned Randy Savage and the Ultimate Warrior "who I've had experience with. "I'll go out on a limb and say my Wrestlemania match with the Ultimate Warrior might not make it into the greatest moments aspect of the '30 Years of Wrestlemania' history—although it was a phenomenal moment for me." Triple H said. At Wrestlemania XII, the Ultimate Warrior, who is available (so far) as a pre-order incentive, came out of a three-year semi-retirement and smashed Triple H in a match that lasted less than two minutes. It wasn't said if all of the fighters are available in the main mode of play or if they must be unlocked, or if the bouts must be played sequentially or may be played in any order. The entire roster will be revealed this Saturday at 3:30 p.m. at SummerSlam over 2K Sports' Twitch.tv feed. "30 Years of Wrestlemania" will do more than just stick two guys in old costumes in the ring. Like last year's celebration of the WWE's Attitude Era, this one will make sure the arenas, their crowds and superstars' ring entrances all are period-authentic. Moreover, the presentation will use a graphics package evocative of the era, in some cases using a special filter to show a 1980s or 1990s match as it appeared in standard definition. "Iconic cut scenes" during the matches will also appear. Players will be given specific objectives to complete in order to recreate the events of a classic match, and will be rewarded with unlockables for doing so. "We're extremely excited about this concept; 30 years of Wrestlemania is a massive milestone for the WWE universe and our fanbase," Levesque said. 2K Sports did something similar two years ago with "NBA's Greatest," in NBA 2K12, a look back at that sport's iconic teams and players, also presented with broadcast effects authentic to their period. And "The Jordan Challenge" of NBA 2K11 also asked players to recreate its title star's greatest feats in-game, with an unlockable player as an incentive.